Cyclone Bolt is a A193 Stainless Studs manufacturer, producing B8 and B8M stainless studs with diameters ranging from 1/2” – 4”. The table below shows a summary of the stainless studs that Cyclone can manufacture. Class 1 stainless studs are produced from solution-treated material, whereas Class 2 stainless studs are made from solution-treated material that has been strain hardened. Austenitic steels in the strain hardened condition may have non-uniform properties throughout the diameter’s cross section, particularly in stainless studs larger than 3/4″ diameter. A193 B8 and B8M stainless studs are standardly provided as class 1 but are also available in class 2. Stainless studs are cut-to-length all-thread rod, and common applications include: bolting flanges together, anchor bolting, and general fastening. 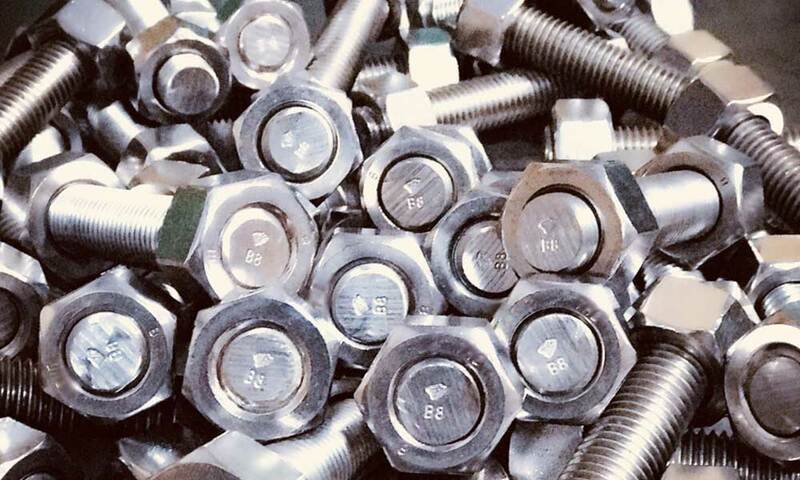 The specifications for stainless studs are governed by ASTM A193, and the most common material grades are B8 and B8M. The length for stainless studs can be measured using either: overall length (OAL) or first useable thread to first useable thread (FTF). Industry standard is now OAL, but to calculate FTF measurement from OAL, simply subtract a quarter of an inch. The thread pitch (threads per inch) for stainless studs with diameters below 1” is governed by coarse fastener thread pitches. For all diameters 1” and above, B7 studs use 8UN, which means there are 8 threads per inch for these sizes. The hardware related to stainless studs depend on the grade and are listed below.